Geotextiles are commonly used as cost-effective construction materials in hydraulic engineering. Over the past decades, woven and non-woven textiles, geogrids and composite materials have emerged to play a key role in canal and waterway engineering, the construction of man-made lakes, barrage engineering and coastal protection. They perform a wide range of tasks, including separation, filtration, drainage, protection, packaging, reinforcement and sealing. Depending on the precise application, choosing the ideal geotextile and the correct dimensions can be an easy or highly complex task. Wharf No. 31 at the Rostock Seaport was built in 1960; it was primarily used for unloading fruit from abroad. The wharf was designed to handle the most common types of vessels and the depth of 9.65 metres was sufficient for most ships. At the beginning of the 1990s the wharf was equipped with a drive-up ramp and used for ferry traffic. Due to the much larger tonnage of the vessels and the use of bow thrust units, the seabed started eroding fast. Sandbags were used to fill the cavities, but when the ferry companies started using different vessel types, other sections of the seabed also started eroding. Rostock Seaport decided to reinforce the floor using Incomat® mats, which offered a low-cost answer to the problem of protecting a large area against erosion for many years. 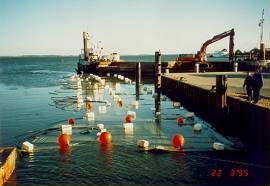 The Baltic Sea office of Nordseetaucher GmbH, located in Stralsund, was contracted to carry out the work. Our job was to develop a solution that addressed all the specific problems of the site. As our supplier we appointed Huesker Synthetic, where we received expert advice from Dr Flügge. Incomat® Standard mats were selected to reinforce the bed and counteract erosion. Incomat® mats are made of two high-strength polyamide and polyethylene woven layers joined together with spacers of different lengths, depending on the required mat thickness. They can be filled with all pumpable materials; in this project concrete was used to fill the mats. The mesh size of these mats is narrow enough to keep all the fine grade filling material in, but permeable enough to allow excess water to escape. For the project, the standard 3.75 m wide Incomat® cement mats were joined together to form elements that were 11.25 m wide and 10.00 m long. The mats were double-stitched along the sides and eyelets were punched in. An additional fill hole was left in each element as the cement we were using - B 35 cement - has far greater pumpability than standard grouts. The ships' propellers create turbulence which swirls up the sand on the seabed; this can lead to a 'sand-blasting' effect which can decrease the lifespan of geotextiles. To protect the Incomat® mats from sand attrition, a special felt was stitched to the top of each mat to increase its surface area. The existing irregularities on the seabed were filled with coarse gravel. In order to secure the mats firmly to the sheet pile wall we welded on angle irons with long slits; the mats were attached by inserting 12 mm bolts through the eyelets in the mat seams. As all work had to be carried out while normal ferry services continued, we were faced with the task of securing the mats prior to filling to avoid them being washed away by the currents caused by the propellers. This was done by inserting 0.5 m long pegs through the eyelets in the seam and anchoring the mats to the seabed. The individual elements were also joined using this simple, but very effective, method. While the mats were being filled two divers were constantly underwater to monitor the expansion of the mats and ensure that the spacers inside the mats did not tear. Underwater work was completed by filling the gap in front of the sheet pile wall with concrete to prevent the seabed under the mats from eroding. The inlet holes were closed and the final position of the mats was checked. These mats are very easy to handle, both on the surface and underwater, and they do not require sophisticated technology to lay, making them an ideal and highly cost-effective solution for all seabed reinforcement projects. The fact that the mats can be manufactured in all different sizes means that they can be customized to the specific layout of the sheet pile wall. All piles and dolphins can be incorporated in the reinforcement simply by inserting cuffs in the mat elements. Nordseetaucher executed a further seabed reinforcement project at the North Quay in Vitte, Hiddensee; the project was carried out in conjunction with Von Essen Hydraulic Engineering, Rastede. At the North Quay in Vitte, Hiddensee, several factors were contributing to seabed erosion: in several places the piles had not been driven in deep enough, and the increase in passenger ferry traffic was causing the armour to subside. Urgent reinforcement was required. Due to the special geological characteristics of Hiddensee, which is an island close to Rügen in the Baltic Sea, it was necessary to bring in all the equipment required on two utility vessels. The "Jan Berghaus" and the "Henriette", both owned by Von Essen Hydraulic Engineering, were used for this purpose. The concrete grout was mixed on board and pumped into the mats with the help of diving personnel. The engineering firm in charge of the project, AIU, Stralsund, selected Incomat® Slab mats for the project. These mats offer particularly high biaxial deformability due to the drainage strips between each mat, and can be used on very soft ground, such as mud and silt. The drainage strips allow the mat to counteract erosion around the edges by "folding in". With Nordseetaucher's help, 1,900 m2 of Incomat® Slab mats were laid at the North Quay and secured by attaching them to cable links previously fixed to the bottom of the sheet pile walls. The mat layout was designed to incorporate all piles and dolphins. Special cuffs were constructed on-site and fitted. Concrete was then laid along the bottom of the sheet pile walls to prevent further erosion. The entire project took one-and-a-half months to complete. The commune of Hiddensee benefited from low-cost, high-performance seabed reinforcement thanks to Incomat® mats. Los geotextiles son materiales de construcción de bajo coste usados comunmente en obras de ingeniería hidráulica. Durante las últimas décadas tejidos urdidos y sin urdir, materiales de rejilla y compuestos juegan un papel esencial en la canalización, la construcción de lagos artificiales, la ingeniería de presas y la protección de las costas. Realizan un amplio espectro de funciones, incluyendo separación, filtración, drenaje, protección, refuerzo y sellado. Dependiendo de la aplicación, la elección del geotextil ideal y sus correctas dimensiones puede ser un trabajo fácil o muy complejo. El Muelle 31 del Puerto de Rostock fue construido en 1960 y utilizado básicamente para la descarga de fruta. El muelle estaba diseñado para los otrora más comunes navíos y una profundidad de 9,65 m era entonces suficiente. A principios de los años 90 el muelle se equipó con una rampa y se usó para el tráfico de línea. Debido al mayor tonelaje de las embarcaciones y la utilización de unidades de avance de proa, el fondo comenzó a erosionarse rápidamente. Para rellenar los agujeros se utilizaron sacos de arena, pero cuando las compañías de ferries comenzaron a usar diferentes tipos de barcos, también otras zonas del suelo marino empezaron a erosionarse. Las autoridades portuarias de Rostock decidieron reforzar el suelo utilizando geotextiles Incomat®, que ofrecían una solución económica para el problema de protección contra la erosión de una amplia zona durante muchos años. La sucursal de Nordseetaucher GmbH en el Mar Báltico, localizada en Stralsund, se encargó de llevar a cabo el proyecto. Nuestra tarea consistía en desarrollar una solución para los problemas específicos del sitio. En el Dr. Flügge de la empresa Huesker Synthetic econtramos un asesor y distribuidor competentes. Elegimos los geotextiles Incomat® Standard para reforzar el suelo y contrarrestar la erosión. Están hechos de dos capas de urdidos altamente robustos de poliamida y polietileno del espesor deseado para los geotextiles. Se pueden rellenar con cualquier material bombeable. En este caso se usó hormigón. La medida de la malla de estos teotextiles es lo bastante angosta como para confinar los finos, pero al mismo tiempo permitir el libre filtrado del agua. Para este proyecto se unieron los geotextiles Incomat® cemento de la anchura estandard de 3,75 m para formar los elementos que acabaron siendo de 11,25 m de ancho y 10 m de largo. Las mallas tenían un cosido doble en los lados y se perforaron ojetes. Un agujero adicional para el relleno se dejó en cada elemento, ya que el cemento que usábamos (B35) tenía menos capacidad de bombeo que las lechadoras estandard. Las hélices de los barcos crean turbulencias que levantan la arena del fondo y que pueden provocar un efecto de “explosión de arena” que acaba reduciendo la durabilidad de los geotextiles. Para proteger las esteras Incomat® del desgaste de la arena, se cosió encima de cada una un fieltro especial que aumentaba el área de superficie. Las ya existentes irregularidades en el fondo se rellenaron con grava. Para fijar firmemente los geotextiles al tablestacado soldamos ángulos de hierro con largos solapes. Los geotextiles se sujetaron insertando pestillos de 12mm a través de los ojetes en las costuras de las esteras. Puesto que los trabajos tenían que llevarse a cabo mientras se desarrollaban con normalidad los servicios de los ferries, antes de su rellenado tuvimos que asegurar los geotextiles, no fuera que las corrientes causadas por las hélices se los llevaran. Así, se insertaron piquetes de 0,5 m de largo a través de los ojetes en la costura y se anclaron los geotextiles al fondo submarino. También usamos este método tan simple pero efectivo para unir los elementos individuales. Mientras se rellenaban los geotextiles dos buzos controlaban bajo el agua la expansión de los geotextiles para asegurarse de que los distanciadores en las mallas no se rasgaban. El trabajo submarino se completó rellenando el hueco frente al tablestacado con cemento, para así prevenir la erosión del suelo marino situado bajo los geotextiles. Los agujeros de conducción se cerraron y se controló la posición final de los geotextiles. Estos geotextiles son muy fáciles de trabajar, tanto en la superficie como bajo el agua, y no requieren una tecnología sofisticada para su montaje, lo que los hace una solución ideal y de bajo coste para todos los proyectos de refuerzo del suelo marino. El hecho de que los geotextiles pueden manufacturarse a medida significa que se pueden adaptar al trazado del tablestacado. Los pilotes se pueden inserir en el refuerzo insertando machetes en los geotextiles. Nordseetaucher ejecutó otro refuerzo en el Muelle Norte en Vitte, Hiddensee. El proyecto se llevó a cabo en conjunción con Von Essen Ingeniería Hidráulica en Rastede. Diferentes factores estaban allí contribuyendo a la erosión del fondo: en algunos lugares los estacados no estaban insertados con la suficiente profundidad; también el incremento en el tránsito de pasajeros de ferries estaba causando que la armadura descendiera. Se hizo urgente su refuerzo. Debido a la situación de Hiddensee, una isla en el Mar Báltico cerca de Rügen, fue necesario trasladar todo el equipamiento mediante dos barcos: el “Jan Berghaus” y el “Henriette”, ambos propiedad de Von Essen Ingeniería Hidráulica. A bordo se mezcló la lechada de cemento y fue bombeada en los geotextiles con ayuda de personal de buceo. 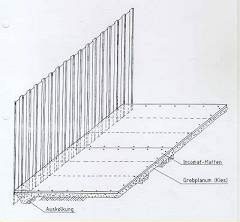 La empresa de ingeniería a cargo del proyecto, ATU de Stralsund, eligió geotextiles Incomat® planchas, que ofrecen una alta capacidad de deformidad biaxial debido a las tiras de drenaje entre cada plancha, y pueden usarse en terrenos muy blandos, como arena y barro. Estas tiras de drenaje permiten al geotextil contrarrestar la erosión en los extremos replegándose. Con la ayuda de Nordseetaucher se tendieron en total 1.900m² de geotextiles Incomat® planchas en el Muelle Norte y se aseguraron atándolos a cables previamente fijados en el fondo del tablestacado. El diseño del geotextil fue pensado para incorporar todos los estacados. In situ se construyeron y adaptaron machetes especiales. Entonces se tendió el cemento en el suelo del tablestacado para prevenir mayores erosiones. El proyecto en su conjunto llevó un mes y medio para ser completado. Gracias a los geotextiles Incomat®, el concejo de Hiddensee pudo beneficiarse de una estabilización del suelo marino de gran rendimiento y de bajo coste.